Prime Minister Netanyahu convened an emergency meeting in his office as the investigation noose tightens on him and his close aides. The agenda of the meeting has not been made public but a source told Channel 2 that the meeting is aimed at preparing a “media blitz” in the coming days as a response to the investigations. At least 5 ministers and several members of the parliament reported to be allies of the Netanyahu attended the meeting.There are ongoing investigations into the submarine scandal and the Bezeq affair. Avi Gabai’s victory as the new head of the Labor party has also raised concerns within the ruling Likud’s ranks. The Prime Minister’s personal lawyer David Shimron was questioned by the Police’s fraud unit on Thursday in relation to the submarine deal as allegations of possible corruption and bribery which is estimated to be worth billions of shekels. Netanyahu is not directly linked to the scandal but senior officials such as the former deputy head of the National Security Council Avriel Bar-Yosef and Thyssen Krupp’s Israeli agent Miki Ganor have been detained as investigations progress. Thyssen Krupp, a German shipbuilding company, has been silent about its dealings in sealing the agreement. However, Netanyahu allegedly played a role in facilitating the Bezeq’s empowerment as the leading telecommunications firm in the Jewish State. 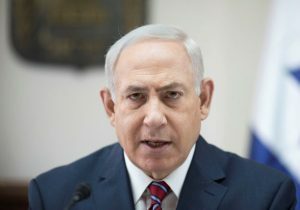 The Prime Minister refuted the allegations as “futile” but State Comptroller Yosef Shapira claims that Netanyahu’s failure to expose his connection to Elovitz in a conflict of interest declaration has raised doubts over the treatment accorded to Bezeq by Shlomo Filber, Communications Ministry director-general. Filber was questioned for the second time by the Israel Securities Authority recently. He was appointed to the post by Netanyahu in June 2015. Posted by Peter Mulvany on Jul 13 2017. Filed under Headlines, World News. You can follow any responses to this entry through the RSS 2.0. Both comments and pings are currently closed.